Rockport is a shoe brand known around the globe for innovation. They have more than four decades of experience, yet they never stop pushing the boundaries. Many of their products were designed to blur the lines between athletic shoes, comfort, and style. The result has been various shoes, boots, and sandals that can withstand heavy physical activity while looking and feeling good. These are the types of shoes that you can wear to the beach and to work. A sandal may not seem like a complicated product, but looks can be deceiving. Shoe manufacturers struggle to strike the perfect balance between comfortable materials and durability. A sandal needs to fit firmly, yet also be adjustable for different foot widths. It needs to slip on easily but not slip off when you’re running or walking. The Rocklake flat sandal manages to do all of this, though it may appear like an average sandal from the outside. The Rocklake is 100 percent leather on the outside with a synthetic sole, an EVA midsole, and a rubber outsole. This is that perfect combination of comfort and durability that was previously mentioned. The synthetic sole and the leather upper ensure that the sandal stays together even after years of use. The rubber outsole grips the ground to provide traction while also absorbing the impact of your steps. The EVA midsole helps your feet stay comfortable even if you’ve been wearing the sandal all day long. 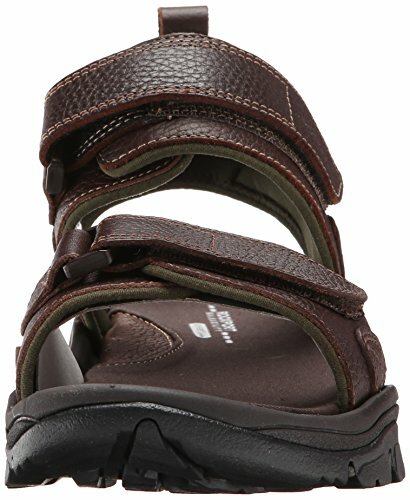 This sandal uses a standard dual-strap system to keep the shoe firmly on your foot. The hook-and-loop straps are easily adjustable so that it makes a nice fit even if you have a wide foot. And if your foot is prone to swelling, then you can easily adjust the straps throughout the day and continue to wear the sandal comfortably. 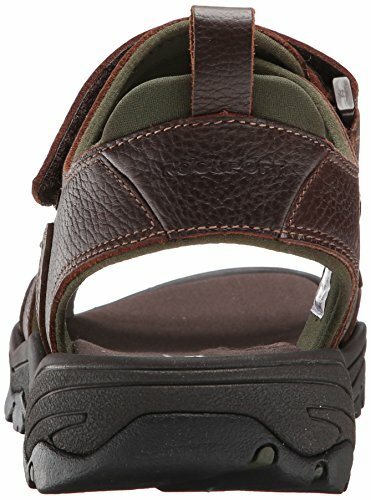 The Rocklake flat sandal has been a popular sandal for men for decades now. They are also very popular with diabetics who need comfortable walking that don’t risk cutting off circulation. 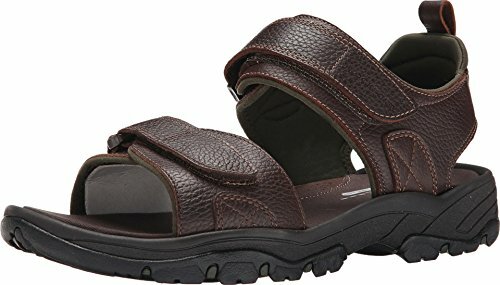 Whether you’re a young man on the town, a diabetic who needs to stay active, or a senior who wants to start walking more; these sandals are a great fit. Another quality Rockport shoe, this sandal is an all-around top pick that is highly stable, looks great, and is comfortable to wear.